WELCOME TO TE JUNGLE, IT'S TIME TO EAT!!! 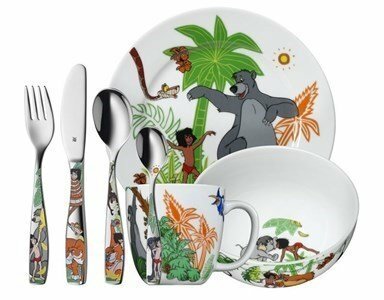 An amusing dinner service, coming straight from the jungle! Everything they need is in here! Plate, mug, cup, cutlery and above all, great excitement! The kids learn how to eat alone while having fun. Suitable for children with +3 years. Set in porcelain and stainless steel with Cromargan ® protection.